Just a few hours to go until race time. How do some of the main reporting outlets see how HepsXC will go today? Letsrun.com: LRC opened up their conference and national polls to their readers on Wednesday, where they asked their readers to rank the teams with their predicted order of finish within their given conference or if NCAAs were contested today. Our focus is on the conference predictions. According to their readership, the Penn men will have the slight edge over Princeton by 2 votes and Columbia by 5 votes (75 to 73 to 70, respectively), even though Columbia got the highest number of 1st place votes (4) to Princeton (3) and Penn (2). Brown (56, 1 first place vote) and Dartmouth (36, 1 first place vote) are the other teams that got first place votes. Yale (35), Cornell (33), and Harvard (18) round out the rankings. For the women, Columbia is heavily favored by LRC, getting all of the first place votes and 24 points. Second place appears to be a tight battle as Cornell (15) edges out Princeton (14), Penn (13), Yale (13), and Dartmouth (12). Brown (9) and Harvard (8) round out the pack. It should be noted that only three people participated in the women’s poll while 11 people participated in the men’s poll. 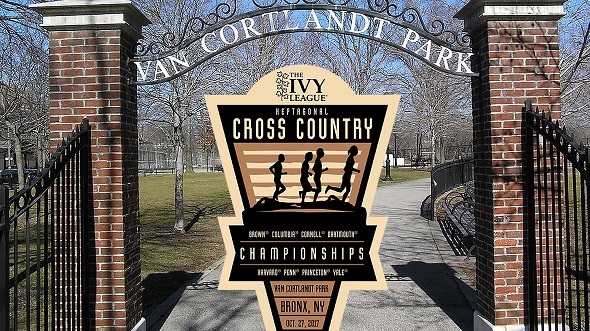 Letsrun.com did not do a formal meet preview this year, but in the fan Heps Cross Country thread, the website founders personally believe that it will be a battle between Penn and Princeton, giving the edge to Princeton while giving Cornell’s Dominic DeLuca the individual title. They didn’t really comment on the women’s race though. Flotrack: Five Flotrack staff members gave predictions of which team will win at each of the Division 1 conference meets that will take place this weekend. According to the Flotrack crystal ball, Princeton edges out Penn 3-2 for the men’s title, while Columbia is the favorite in the women’s race (4 votes) while one staffer thinks Dartmouth has a chance. Hepstrack.com: and what about our polls? Well, as of 7:30am this morning, over 202 votes were cast in the men’s poll and 150 were cast for the women, giving their predictions on which teams will win each race. It is a near tie in the men’s competition with Penn having one more vote than Brown (27.72% to Brown’s 27.73%). Like in the other polls we’ve seen, Columbia are the favorites in the women’s competition. Just a reminder – follow the meet through social media (#HepsXC or #IvyHeps) or via the live results link. Racing starts at 11am. This entry was posted on Friday, October 27th, 2017 at 6:45 am. It is filed under Featured, Heps Champs, Spotlight. You can follow any responses to this entry through the RSS 2.0 feed.